Kwashiorkor (kwash-e-OR-kor) is a form of severe malnutrition that affects children living in poverty in tropical and subtropical parts of the world. It is caused by a lack of protein in the diet. Kwashiorkor stunts growth and causes children to have bloated bellies and thin arms and legs. 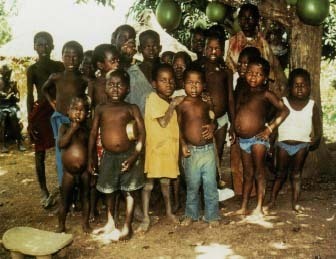 Many children in this West African village show signs of kwashiorkor. Their stomachs are bloated, their arms and legs are thin, and their skin is flaky. hard time feeding all of the children. Nevertheless, Tanya was a healthy infant because she was breastfed; breast milk contains all of the protein and other nutrients a baby needs. But when Tanya was just over a year old, her mother had another baby and Tanya could no longer breastfeed. Instead, she had to eat the only food available: white rice, cassava, and yams. These foods contain mostly carbohydrates and have almost no protein. Because of the lack of protein in Tanya's diet, she developed kwashiorkor: her stomach was bloated, her arms and legs grew very thin, her skin flaked, and she was very weak. Tanya is typical of children from all around the world whose families are too poor to feed their children the nourishing food they need. Kwashiorkor is a disease caused by the lack of protein in a child's diet. Kwashiorkor is a type of protein energy malnutrition (PEM) that is widespread throughout the developing world. Infants and children growing up in tropical or subtropical areas (such as Africa, Asia, and South America) where there is much poverty are at risk for kwashiorkor. The term "kwashiorkor" comes from a word used in Ghana that means a "disease of a baby deposed from the breast when the next one is born." Kwashiorkor usually happens when a baby is weaned from protein-rich breast milk (for any reason) and switched to protein-poor foods. In impoverished countries, protein-rich foods are difficult to acquire. Children with kwashiorkor have edema (excess water retention in body tissues), which makes them look puffy and bloated. They are weak and irritable, and in many cases their skin flakes, and their hair loses its curliness and color. If left untreated, kwashiorkor causes enlargement of the liver, loss of fluids (dehydration) from the bloodstream even when the child has edema, stunted growth, and severe infection due to a weakened immune system. It also can result in jaundice, drowsiness, and a lowered body temperature. An international team of medical workers traveling in Liberia saw Tanya sitting on the ground too tired to play and realized how sick she was. They took her to the hospital in Tubmanburg, where she was kept warm and given fluids to replace those she had lost. Initially, she was given small amounts of milk and vitamin and mineral supplements. Zinc supplements helped stop her skin from flaking. After the edema went away, the doctors gave her a high-calorie diet rich in protein. Of the children who are hospitalized and treated for kwashiorkor, 85 percent survive. Most children properly treated for kwashiorkor early enough recover completely. However, children who develop kwashiorkor before the age of two, like Tanya, usually experience stunted growth. Because kwashiorkor is a dietary deficiency disease, it can be prevented by eating a well-balanced diet. However, in many parts of the world, people are too poor to provide their families with protein-rich foods, or such foods are not available. International efforts to provide food and to teach people about growing different kinds of foods, eating the right foods, and ways to limit family size are helpful in the fight against malnutrition, but it remains an ongoing problem in developing countries. Tamberlane, William. Yale Guide to Children's Nutrition. New Haven: Yale University Press, 1997.